For my Birthday. I am starting to perfect the decorations. 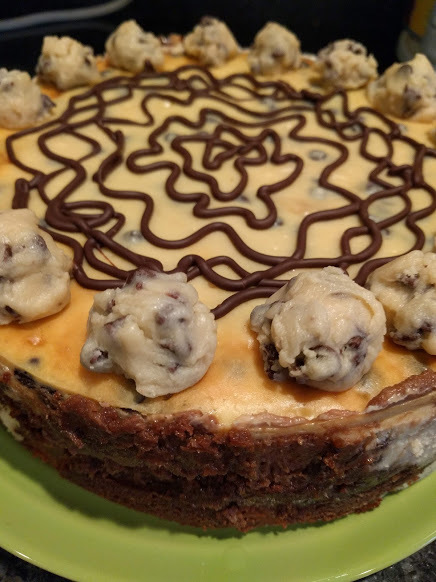 So I liked the FLAVOR of the brownie bottom chocolate chip cookie dough, but hated the glop on top of the cheese cake. 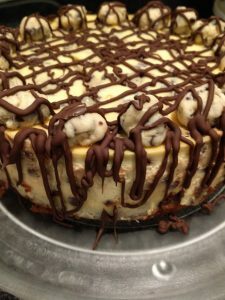 So do, like The Cheese Cake Factory and bake chocolate chip cookie dough balls INTO the batter. At the bottom is the recipe we like the most. In a stand mixer (or hand mixer), cream together butter and both sugars on MED-HIGH speed until light and fluffy. Beat in sweetened condensed milk and vanilla extract. Beat in salt and flour. Stir in mini chocolate chips. Preheat oven to 350 degrees F. Line bottom of a 9″ springform pan with parchment paper and spray paper and sides of pan with cooking spray (I use a baking spray, but you could use regular spray and lightly dust with flour instead). Turn off heat and whisk in sugar. Set aside to cool for 5-10 minutes, stirring often. To a mixing bowl, add in melted chocolate mixture, milk and eggs, whisking quickly so the residual heat doesn’t cook the eggs. Use a wooden spoon to stir in flour until just combined. Pour batter into prepared pan in an even layer, and bake for 25 minutes. Remove brownie pan from the oven and set aside. Using a stand mixer (or hand mixer), beat all cheesecake ingredients together until mixture is smooth. Put down a layer of cookie dough balls, pour in the batter, then press another lay of balls into the top, cover as best you can. Reserve about 16 balls to garnish. Bake for 50 minutes, until center is slightly jiggly (or when an instant read thermometer inserted into the center reads 150. Remove from oven and cool at room temperature, with the pan on a wire rack for 30 minutes to 1 hour. Place pan in the refrigerator for 4 hours, or overnight to chill and firm up to that amazing cheesecake consistency. 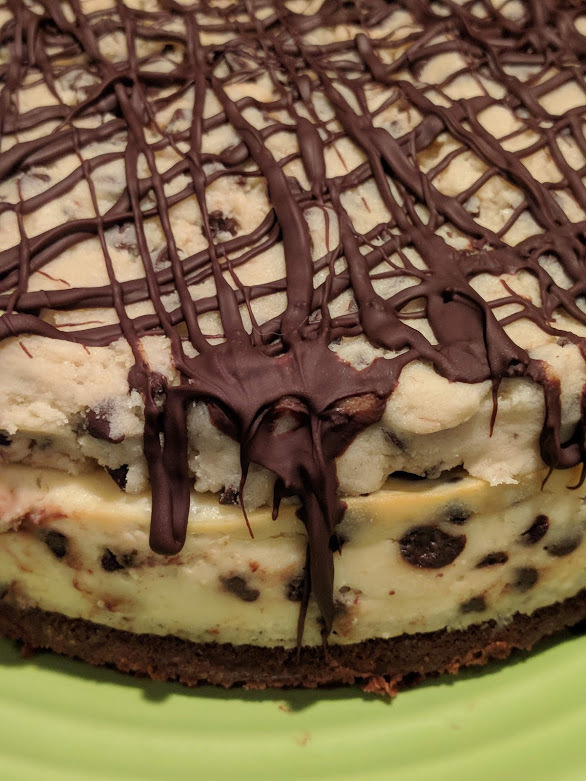 FINISH THE CHEESECAKE with the leftover balls and melted chocolate drizzle. 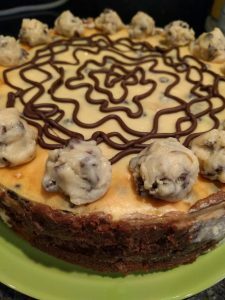 This tasted good but the cookie dough topping crushed the cheesecake when you eat it. 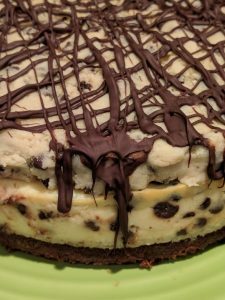 Hubby suggested that I try making the cheesecake cookie dough flavored or make little balls of dough to bake into the cheesecake. 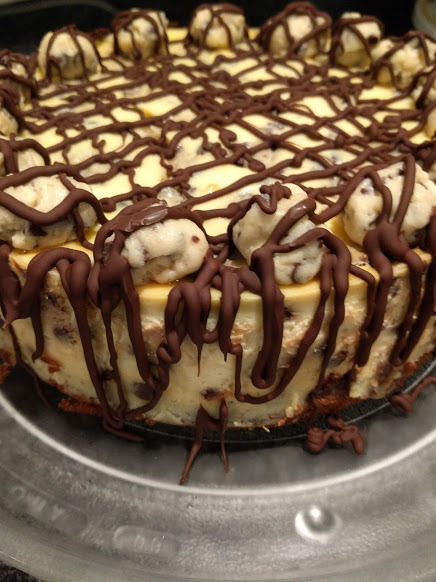 So those cheesecakes will be coming soon. 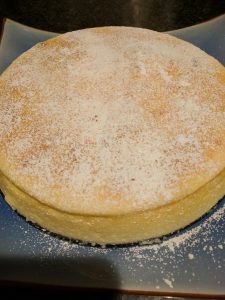 Year of the cheesecake: Buddy Valastro’s Italian Ricotta cheesecake. It leaked OUT of the pan-a lot. I think I need to drain the ricotta. Also, I learned that if you have the smallest amount of egg yolk in your whites stiff peaks won’t form. It is true, they weren’t making that up. 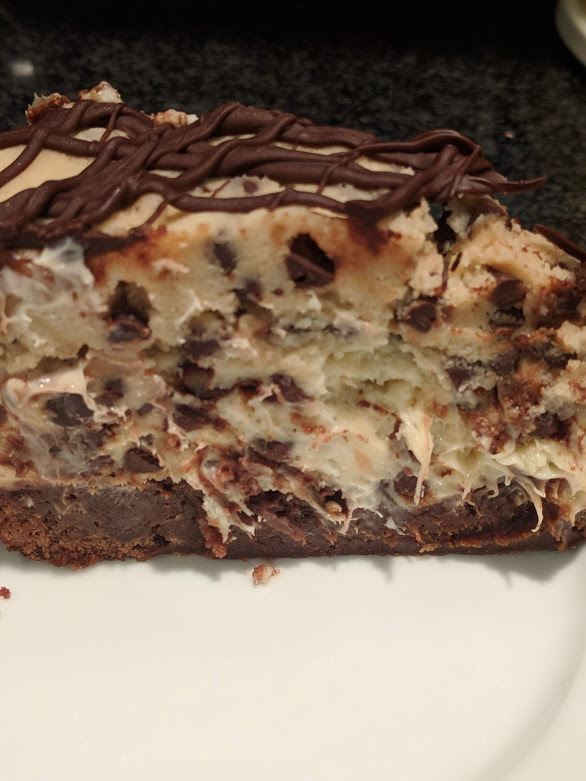 Also, I discovered I don’t like Italian cheesecakes. 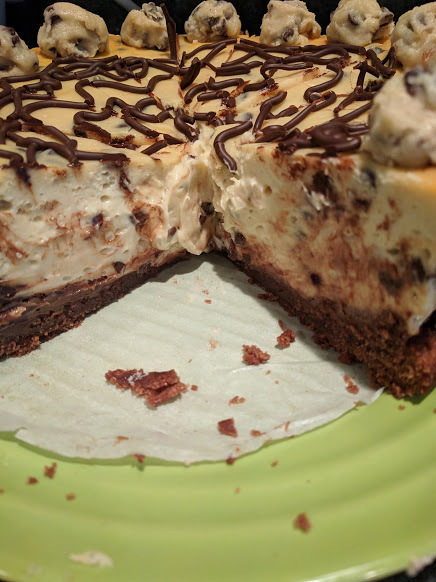 I like cream cheese cheesecakes. But I looked pretty. Year of the cheesecake number three: New York cheesecake II from Allrecipes.com. 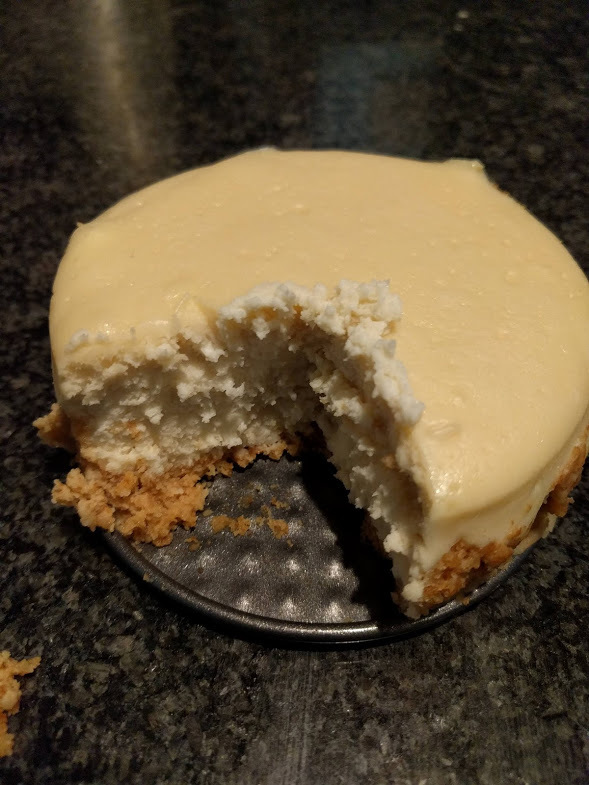 This is a solid plain cheesecake. Dink ate 3 pieces already. I am now up to 32 recipes picked out if you count the five Italian cheesecake recipes I found today. I have also solved the leaking pan problem thanks to America’s test kitchen! 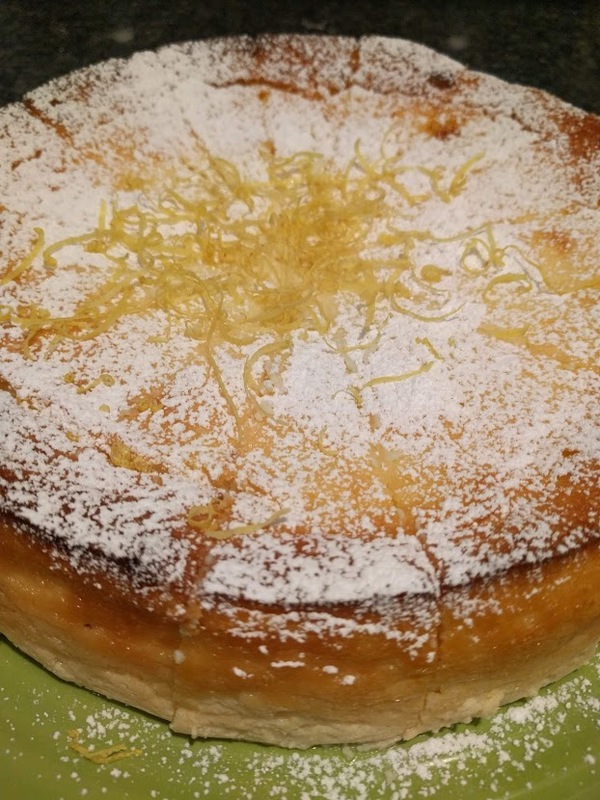 Year of the cheesecake: Chantal’s New York cheesecake. Just trying to get the basics before I go crazy. I am still trying to keep the spring form pan from leaking. Either I didn’t wrap the foil right or steam condensed in the foil to cause the crust to be soggy. America’s test kitchen recommends to use a slightly larger pan to protect your spring form pan in the water bath. I am sourcing those pans to try that next. 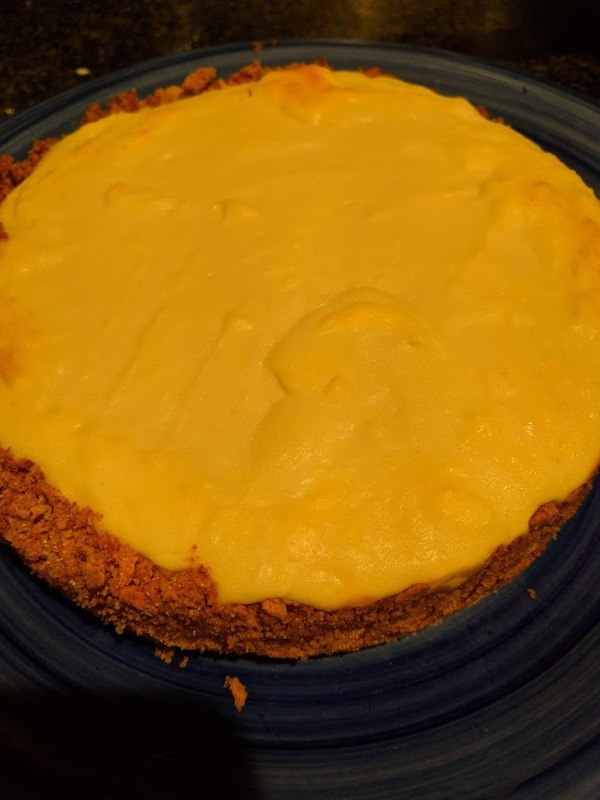 Also, cheesecakes don’t rise when you bake them. I didn’t know that. 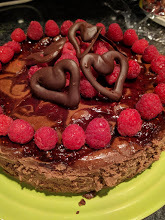 The year of the cheesecake has begun. This recipe was billed as a three ingredient “cheesecake” by Delish but it has you whip egg whites until stiff peaks form making a frothy (to be kind) or a curdy (to be blunt) texture that we don’t associate with a cheesecake.